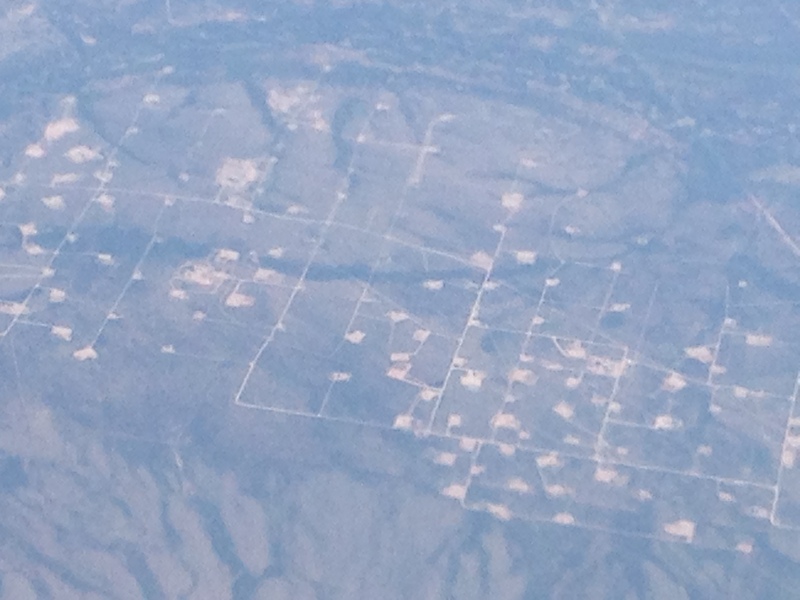 If you ever wondered what Fracking Looked like from the Air…. Water limitations are a problem in many areas of the US and the world. Without water, the efficiency of power plants diminishes as the folks in Washington and California have found out when converting to air cooling their facilities. Losses can be 30% of output which makes that investment in upgrading to 40% efficiency, drop back to 30. Not a good investment, unless you have no option. In water limited places in the world, cooling water will limit the ability to use water-intensive coal, nuclear and oil facilities. Nuclear power has been argued as a green option, but it is green only with respect to carbon production. Nuclear needs copious amount of water to cool the reactor. An while it remains an ongoing option, many are wary after the Japanese experience. There are 6 licenses in the US for nuclear facilities that expire by 2020, and 27 more by 2030. That means over a third of facilities are at their useful life. Creating second generation nuclear plants is a major, challenge at a financial and political level. For the most part China, Russia and India are leading the way with the US a distant 5th in proposed next generation reactors. We just don’t see a lot of nuclear reactors on the US horizon. Why? Renewable and gas. The power generation picture has changed significantly in 10 years with respect to large increases in wind and gas. Renewables have increased from 2.4 to 6.5% of the market in 10 years (to 266 TWh). Wind has been the largest growth area (to 167 TWh) despite ongoing environmental issues associated with migratory birds, minimum wind speeds, and lobbying against wind projects (like Bill Koch did in Cape Cod) or the tax incentives used for renewables (like the Koch brothers continue to do along with Tea Party members in Texas). Wind energy costs have dropped by 40% in 10 years and today the majority of wind energy components are built in the US as opposed to overseas. The subsidies have made this possible by limited private capital risk. Nolan County, Texas alone produced more wind than the state of California, despite the ongoing lobbying against it in Texas. Texas has the largest “wind” reserves in the US and many in the public see the need to take advantage of the high wind areas like Texas ($25 billion to date, $13 billion proposed), the Rocky Mountains and coastal areas that do not conflict with migratory birds routes, landscape views or property rights issues. The Blackfeet Nation in Montana has long known that wind is a valuable resource on the reservation. Overall the state of Montana has the second largest wind potential behind Texas. But like Texas there is conflict – in Montana from the fracking industry. Note that the upper Rocky Mountains is where NextEra installs many of its wind fields. California has also gotten into the wind market with projects proposed in the Mojave Desert, although eagle conflicts impact those permits. However, uncertainty about the ongoing tax break , caused by inaction in the House, caused new wind projects to drop 92%, with a loss of 30,000 jobs in one year which creates questions about wind power expansion in the near future. At the smaller level, combined heat and power (CHP) generation is located at 4200 commercial and industrial facilities today. States are interested. The demand is expected to rise to 40 GW by 2020. Solar markets are often local. Some communities provide incentives for residents to put panels on the roofs. Germany did this and now 25% of their power comes from these solar projects. 2% of houses in Arizona have solar on their roofs. In Hawaii, solar power is half the cost of generated power. However local solar has run into the same issue as wind power – this time the Koch brothers-funded American Legislative Exchange Council has encouraged local power utilities in 21 states to challenge laws that permit solar installations of houses as reducing profitability of power investments by those utilities. Others, like FPL still fund such installations creating and interesting conflict in the market. Gas has replaced coal as the dominant source, both because of less greenhouse gases and because of much higher efficiency in source-power ratios. California, Texas, Florida and New York, among the four largest power demanding states, have seen natural gas use increase significantly in the past 20 years, virtually all at the expense of coal. Fracking has been the primary reason for the expansion of gas. High quality gas can be recovered from areas through horizontal drilling, but only 3-5% of the gas in the foundation is actually removed from the initial frack. Then the returns diminish to about 10-15% of initial withdrawal within 1-3 years, and refracking must occur to increase production. 100% of the gas is unlikely to ever be achievable. Still gas reserves are likely to be producers for some time, although industry experts expect the peak of current fracking technology in 2025, much sooner than some would hope. Despite there being over 2.4 million miles of gas pipelines in the US, the biggest issue with frack gas is pipeline absence in the big fields in Pennsylvania, Ohio and North Dakota. Refineries are starting to crop up in the Midwest and Pennsylvania to address the gas needs – which may reduce the need for longer pipelines and reduce loss (currently 6%). The pipeline solution is varied and many. North American Oil and Gas Pipelines magazine sees a high investment in pipelines by 2020, with decreasing investments through 2035 as gas recovery drops. XL pipeline has dominated smaller pipeline projects designed to bring tar sands oil to refineries in Texas and Louisiana, but there are other spurs and different pipes are planned for different purposes. The obstacles are many – political, environmental, economic through a host of forces that either benefit directly from the pipelines or that benefit from not having the pipelines (think railroads). Of course a couple of recent rail accidents have created more controversy there, but rail is the current solution for many of these remote fields. In a prior blog we talked about the difference between urban and rural counties and the impact of the differences between incomes and how that would affect utilities. Keep in mind that the 40 largest urban counties in the US contain nearly half the US population as do the 50 largest utilities. So in a recent article in Governing, the focus was on the few counties where income was higher than average. In fact, in looking at counties, within the top 20 in per capita income are 10 counties in North and South Dakota. Interesting until you review why. All are in areas where fracking is ongoing and corporate farming is prevelant. It is no surprise that the fracking boom has created wealth in rural areas that have limited populations, limited regulations and state and local officials who are desperate to reduce unemployment and stimulate laggard economies. We noted before that rural counties are often desperate for jobs, so they often ignore what could possibly go wrong when jobs and development are the only priorities for a community. Governing used the example of Wells County, ND where the per capita income has doubled since 1997 and is 75% above the national average. Yet the local governments are looking at which roads they will allow to go back to gravel. How is this possible? The issue is not relegated to just Wells, ND. Despite the fact that many rural communities in areas with intensive farming or fracking have grown 10-15% since 2007, local officials are finding it difficult to raise taxes to pay for infrastructure. Roads are the most obvious and pressing issue because of the impact from fracking traffic. As new wells are constructed, the frackers build new dirt roads and use the existing roadways. Some believe the need to fix many of the roads is temporary so why bother, but it neglects the need to infrastructure improvements in general. The same argument could be used for water and sewer infrastructure as well, but these wealthy rural communities do not want to increase governmental spending to improve any infrastructure, so the opportunity to address the community needs is being lost. What is more interesting is that the states where these rural counties exist, including the Dakotas, along with Montana, Wyoming, New Mexico, and most of the southeastern states are among the states that rely most heavily on federal funding. So when incomes increase, the dependency remains. These are the same states that tax residents the least, spend the least on education, have the poorest health care (and the fewest people signed up for the Affordable Care Act and few have state exchanges) and have the most people in poverty. The dichotomy between reality and the political perception is interesting in these states, which leads one to wonder if the residents of these states like their situation and keep electing representatives that reflect this desire, or they have fallen victim to political interests that cause them to vote consistently against their better interests, or for the interests of a limited few that deny them access to the education, infrastructure, medical care and other benefits their urban and wealthier neighbors enjoy. That is a tough question but the bigger question is how to infrastructure agencies like utilities attempt to overcome either of these perceptions? Neglecting infrastructure, education, medical and the like does not promote local economies, does not create jobs and more likely causes the migration of the best and brightest young people out of the community in search of better prospects, which further imperils their rural situation. Keep in mind that most cities are relatively permanent, but fracking, like mining, oil and timber before them, have been booms and busts. The situation if far more dire after the boomtown than it was before. After all, what could possibly go wrong when 50,000 miners, or frackers, descend upon a community of 1,500 people? They will consume all the resources, then leave. Locally those well paying jobs are imported due to the lack of skills and education, and then they leave with the bust. This has played out many times in the past. It is not sustainable. We need to learn from the past – when the boom hits, make the investments you need in infrastructure, education, medicine, etc. so that the future is better after the bust. Those who live in coastal areas, earn their living in agriculture, manage water utilities relying on water supplies, and drought planners know the truth. Denying that the climate is changing simply ignores reality and delays the ability to respond to its impacts. I realize that those impacts might be 20 or 40 or more years out, but planning is needed because we expect our infrastructure, factories, hoses and economies to last longer than that. Science says change is occurring. We can argue why and how fast, but the reality is that there is change and there are many people that will confront he need to adapt to the situation sooner than later (like us the Fort Lauderdale/Miami area!). So why deny climate change? As we noted in a prior blog, there are several reasons, but many involved business issues. So follow the money. Let’s start with the Koch brothers. The Koch brothers manage Koch Industries, the second largest privately owned company in the United States revenues exceeding $100 billion/year. Many Americans have no idea who they are but they are billionaires who have made their living in the oil business – their father Fred C. Koch developed a new the method for the refining of heavy oil into gasoline. They rely on oil to maintain their wealth and are politically active with conservative organizations including the Heritage Foundation and the Cato Institute, FreedomWorks and Americans for Prosperity, all organizations the dismiss any impact of man on climate change. Why? Well one of the tenets of dealing with climate change is to reduce carbon dioxide emissions which means less reliance on fossil fuels – oil. Whoops – that would be a problem for the Koch brothers because if they say “sure climate change is a problem,” well then that would mean that their entire business model and their wealth is a contributor to climate change, which means they are the “bad guys.” Can’t have that. So following the money tells you that we can’t make our money with oil and support climate change. Let’s look at the other side. Those acknowledging climate change are fully supportive of renewables, which in theory will help climate change by reducing carbon dioxide. But the concept of renewables though is fraught with the problem that few of these technologies are ripe for wide-scale implementation. For example natural gas vehicles or natural gas/hybrids are doable, but where do you buy the natural gas for the vehicle? The technology and distribution networks is 10 or more years out at best and of course if you are in the oil business, why would you be interested in installing the natural gas fuel pumps? So technology and need do not match when you follow the money. How about the Keystone pipeline that would bring oil and gas from these remote areas to refineries in Texas and the Gulf of Mexico states. You can guess the Koch brothers are in favor of the pipeline as they will benefit. So are most oil and gas entities. There are many environmentalists and other opposed to the pipeline because of impacts on water supplies (and other issues). But the railroads are making money by hailing oil and gas from Canada and the Dakotas. Guess which side the railroads are on? The pipeline would take business away from the railroads. Follow the money. Let’s look at our industry. In the utility business, there is a lot of money with the telephone, power, cable and other utilities. These private entities, although regulated, make huge sums of money for their investors. You can follow that money. So who supports water and sewer utilities? We do! We supply over 85% of Americans. But why do we have so much trouble getting funding when 85% of people would benefit. One would think that given how many people we support, we have the money, but we are primarily not-for-profit entities, so we don’t make money for anyone. You can’t follow that money because there is no money. That tells us more about the difficulties we have in securing funding that anything. Fixing it is a little bigger challenge because our representatives and constituents do not understand the financial investment they have in our industry. Their public health and economies are linked to water and sewer. Our services make these other enterprises doable but there is no direct monetary connection to facilitate lobbying on our behalf. I am not sure how to fix this, but we need a better marketing strategy for our services. That’s one thing we know. Fracking and Water – Do They Mix? Let’s start with the basic premise of this conversation – fracking is here to stay! It doesn’t matter how many petitions you get in the mail, fracking is going to continue because the potential for gas production from fracking and the potential to fundamentally change our energy future, near or long-term, far outweighs the risk or economic and security disruptions from abandoning fracking efforts. It looks like there is a lot of trapped gas, even if the well exponentially decay production in the first three years, although many well can be recovered by refracking. It is an issue that residents and utilities need to accept. The question is really how to assess the risks to water supplies from fracking and what is what can we do about it? There are a number of immediate regulatory issues that should be pursued, none of which Vikram Rao (2010) suggests are truly deal killers. They start with the disclosure of the fracking fluids, which for most legitimate companies that are fracking are relatively benign (and do not include diesel fuel). Baseline and ongoing monitoring of formations above the extraction zones, and especially in water production zones is needed. Research on water quality treatment solutions is needed because t may be impossible to completely eliminate escaping gas is needed. Requirements to improve and verify well construction and cementing of formation is needed in all states (they are not now) and recycling frack water and brine should be pursued to avoid impacts on streams and wastewater plants, which limits the loss of water due to fracking operation and the potential for contamination of surface water bodies. It will be important to push for these types of regulations in states like Ohio and West Virginia that need jobs and are likely places for fracking to occur, but they are also likely places where there will be political pushback that is afraid of discouraging job investments, but in reality this is unfounded. The gas is there, so the fracking will follow. The question is will the states implement needed regulations to protect the public. More interesting will be the ancillary issues associated with gas and wet gas. A lot of by products come from wet gas, like polyethylene which can be used as stock for a host of plastics. “Crakers” are chemical processing plants that are needed to separate the methane and other products. Where will those facilities be located, is an issue. Right now they are on the Gulf coast, which does not help the Midwest. Do we really need to ship the gas to Louisiana for processing or do we locate facilities where the gas and byproducts are needed (in the Midwest)? The Midwest is a prime candidate for cracker location, which will create both jobs as well as potential exports. Also stripping the gas impurities like ethane, DEM and others needs to occur. So what do utilities need to look at the potential impacts on their water supplies and monitor. If the states will not make the fracking industry do it, we need to. Finding a problem from fracking after the fact is not helpful. We need to look at potential competition for water supplies, which is in part why recycling frack water brine is needed. Eliminating highly salty brine from going to a treatment plant or a water supply are imperatives. Sharing solutions to help treat some of these wastes may be useful – something we can help the industry with is treating water. We also need to look at the processing plants. We need to be looking at the impact of these facilities in light of water and sewer demands (and limitations). Wet gas facilities will require water as will plastics and chemical plants. Historically a lot of these facilities were in the Midwest and the research and skill sets may still be present. How can these industries can be merged into current water/sewer scenarios without adverse impacts. Communities will compete for these facilities, but good decisions may dictate that vying is not the best way to locate a plant. But there is another impact to utilities and that affects green technologies. The cost of gas is low and looks like it will remain low in the near future. Low gas prices mean that renewable solutions like solar and wind will be less attractive, especially if federal subsidies disappear. Wind is the largest addition to the power generation profile in the last 5 years, while many oil facilities changed to gas. Cheap gas may frustrate efforts to create distributed power options at water and wastewater treatment plants throughout the country which can directly benefit utilities, not just where fracking occurs. So we need to be cognizant of these cost issues as well. And you thought the fracking discussion might not affect you….